1. Law, Courts, and Politics. 2. Law and Legal Systems. 3. Federal Courts. 4. State Courts. 5. Lawyers and Legal Representation. 6. Judges. 7. Mobilizing the Law: Litigants, Interest Groups, Court Cases, and the Media. 8. Trial Courts: The Preliminary Stages of Criminal Cases. 9. Trial Courts: How Criminal Cases End: Bargaining and Sentencing. 10. Trial Courts: How Civil Cases Begin. 11. Trial Courts: How Civil Cases End. 12. Trials and Juries. 13. The Appellate Process. 14. The Supreme Court: Deciding What to Decide. 15. The Supreme Court: The Justices and Their Decisions. Get a behind-the-scenes look at America's legal system with JUDICIAL PROCESS. Combining detailed information about the structures, processes, and dynamics that inform today's judicial system, the Sixth Edition explores the roles and impact of the courts through a variety of controversial cases that continue to spark national debate. 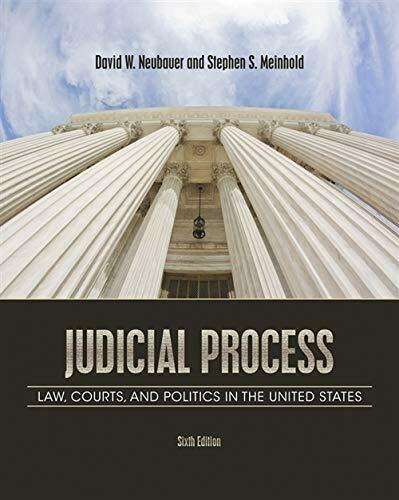 You'll not only discover what the legal rules are but also explore each rule's underlying assumptions, history, and goals, providing a complete and balanced look inside courtrooms in the United States and around the world.